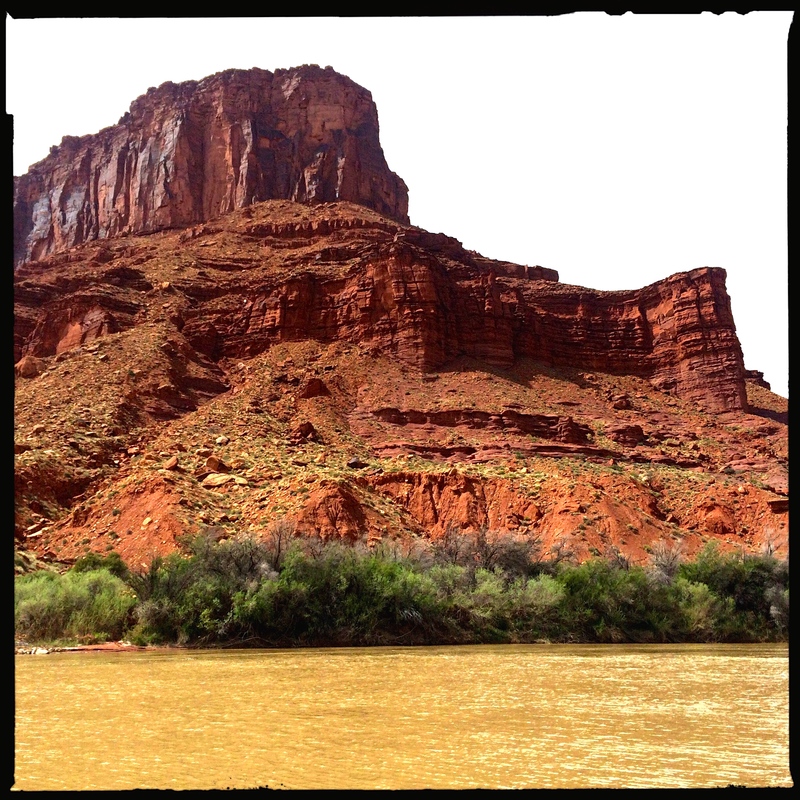 Red rock cliffs along the Colorado River from our campsite. 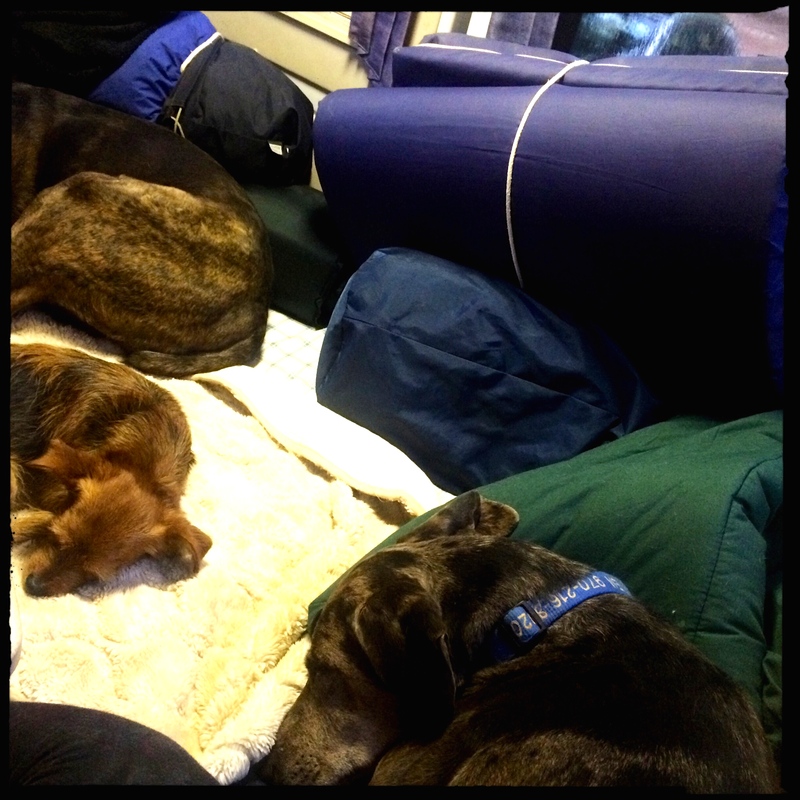 This weekend I camped with a couple of friends, three dogs, and a cat. In some alternate universe it might have been ordinary. Deb and I set off on a long and rich two day adventure three hours away, with my two dogs and diabetic cat and her little dog in the Mothership. We took the turnoff for Cisco, a ghost town in far eastern Utah where river runners take out from Westwater Canyon, the first whitewater stretch on the Colorado River in Utah. 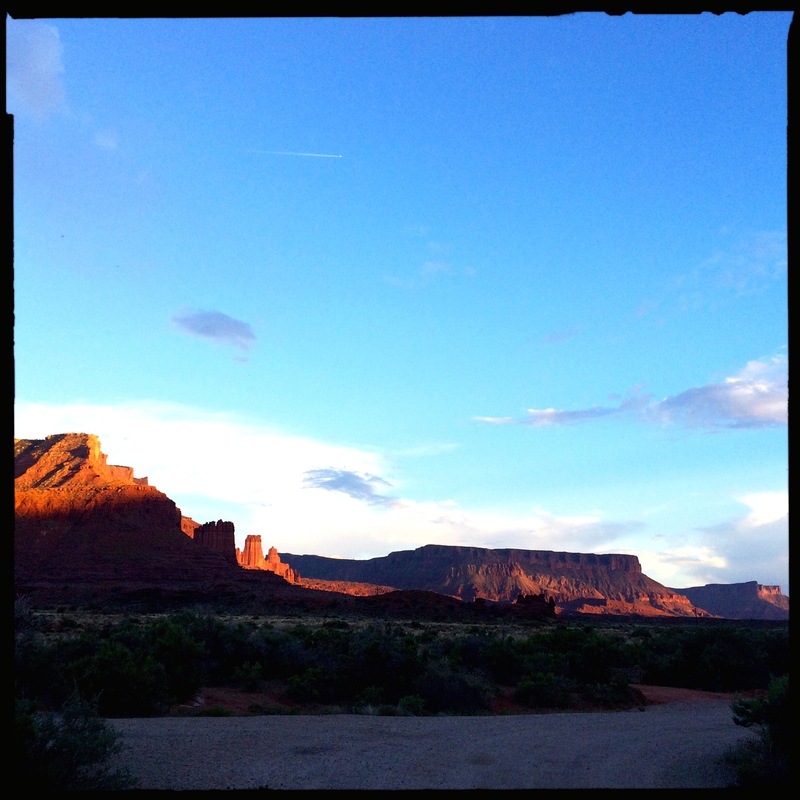 We drove down my favorite highway in the country, Utah 128 along the Colorado River, red rocks, peach rocks, desert varnish, glowing in the rich afternoon light below gathering storm clouds. 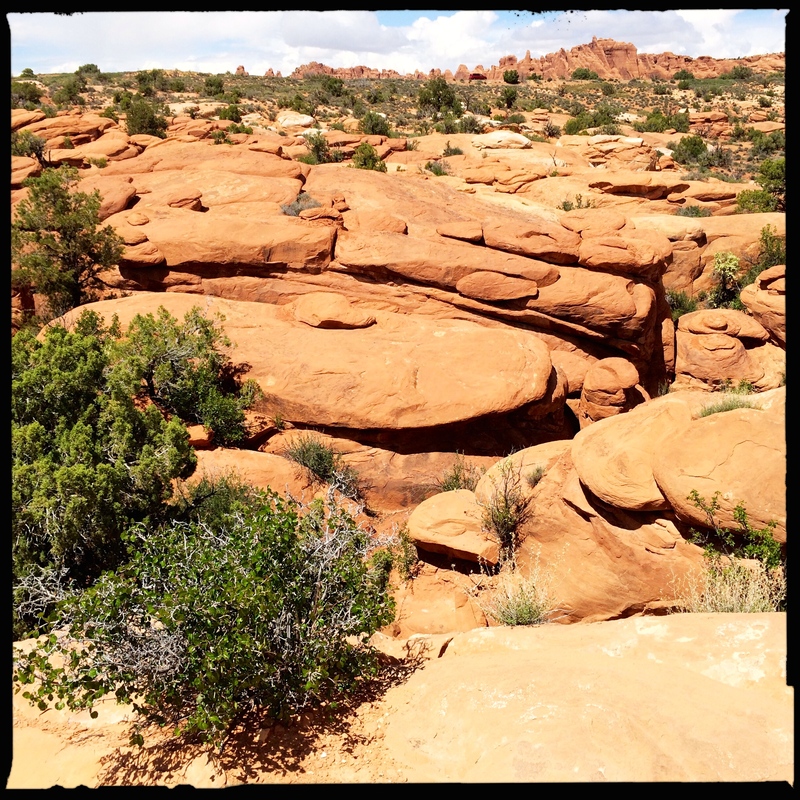 The muddy river flowed beside us as we drove, and collared lizards basked on boulders beside screaming orange globemallow and yellow prince’s plume, their turquoise scales gleaming in the desert sun. We met and set up camp with another friend who chanced to be there too, on her way for a rendezvous with her oldest dearest friends. We laughed and talked and caught up, drank wine, laughed some more. Our first morning I drove ahead to secure a campsite in town, and they decided to hike Fisher Towers, a stunning landmark across the road from where we spent the night at Hittle Bottom, a BLM campground on the river. Fisher Towers from our campsite. Several worries had nagged at me. The few days before I set off on any trip unsettle me. I get keyed up. The diabetic cat, the little dog, would that work out in the same small van? The temperature, the weather, would they cooperate with our plan? Would some random tragedy (and here I thought of several specific potential disasters that could) unravel our vacation? No nameless faceless fears for me, mine are all too graphic. Though some underlying anxiety pervades me these days, and I wonder, is it actually increasing or is it simply that my awareness of it grows? Who knows, but I have my suspicions. And so I found myself driving alone down Utah 128; the red rocks, the river, the winding road itself never fail to soothe me. If it weren’t so bloody hot in summer I would live here. 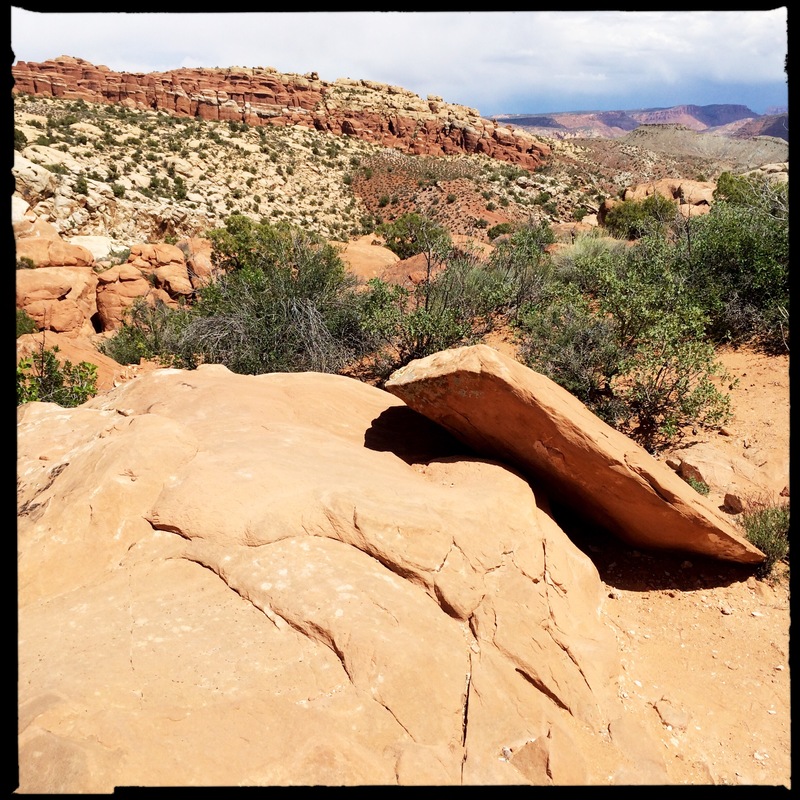 I hummed along the river’s edge through redrock canyons, desert varnish streaking cliffs with iron and manganese oxide, clouds building into tiny thunderstorms on far horizons, walking rains stalking cliffs and canyons, shifting light casting shadows in layers, highlighting first one stunning rock formation then another, quenching rains drenching, cleansing my worries away. 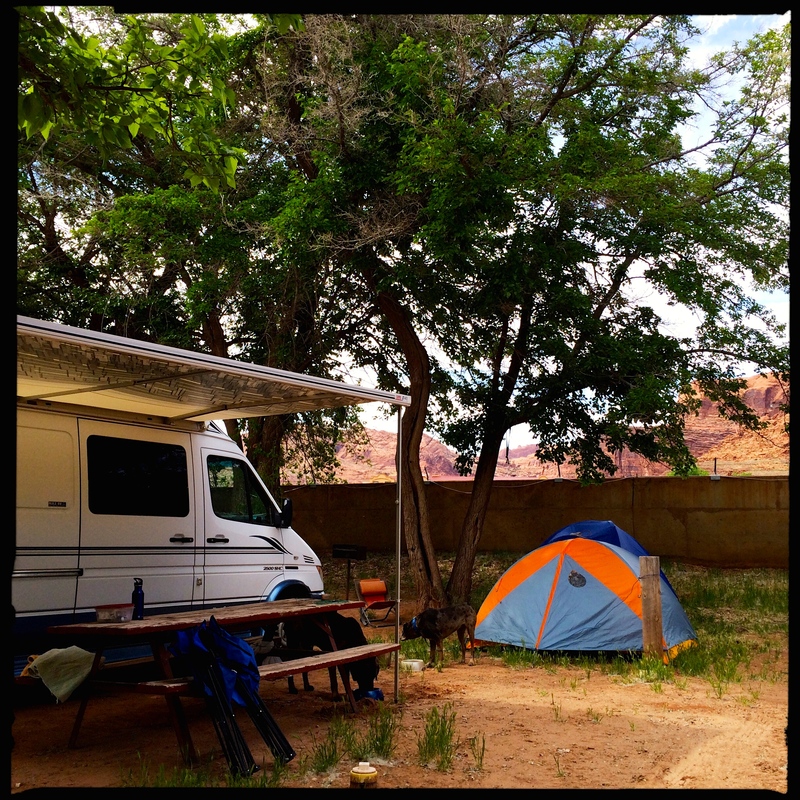 By the time I reached Moab and cellphone reception resumed, I found no loathsome emergency messages, I found the perfect campsite (given the parameters of a commercial RV park), I could breathe. I exhaled, I breathed in, exhaled again. It always takes me a day or two of camping to relax (to let go of the quotidian stressors of my complicated life, to accept the uncertainties of the unpredictable world at large, to forget my seemingly endless responsibilities of managing a household, a livelihood, securing a future) to settle into the immediate impermanence that is the adventure of a road trip. 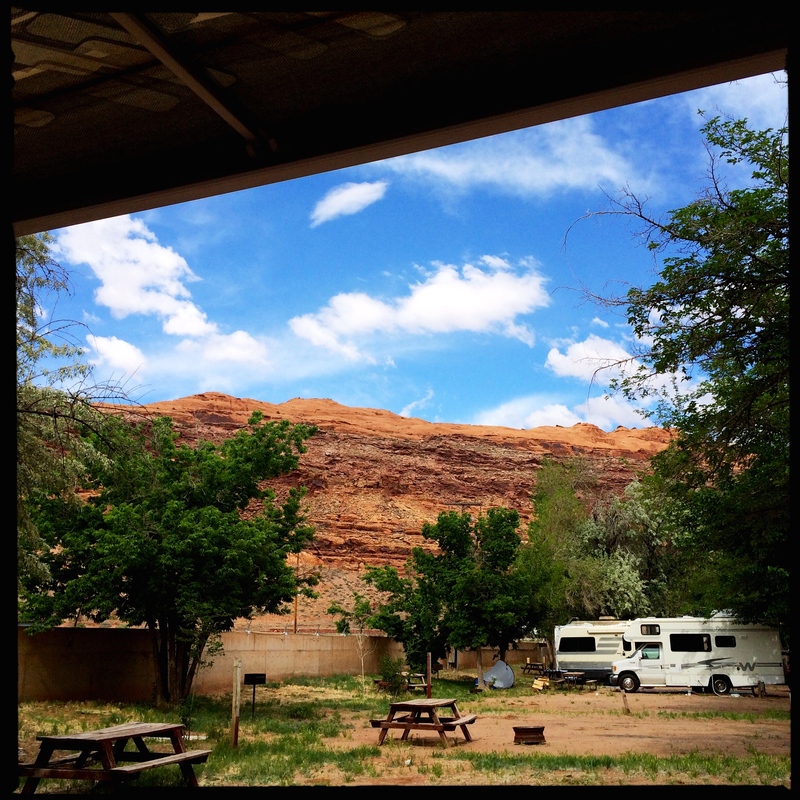 RV parks are dicey at best when what you prefer is wilderness, solitude, above all space. Or maybe above all shade. I saw one with lots of trees and turned in. The cashier was friendly, spending time with each patron, smiling talking laughing, a beautiful girl of twenty or so and so full of light. I happily waited my turn as she helped Gerhard from Germany check in before me. She said she loved my hat, I said I stole it from a friend, we laughed. She sent me to the perfect spot, large enough for our van and two tents, plenty of shade. …and just enough space. We made sure potential campers could see all three dogs, and this is surely one reason we had vacant sites around us. The Mothership parked with awning extended, the friends arrived and pitched their tents. 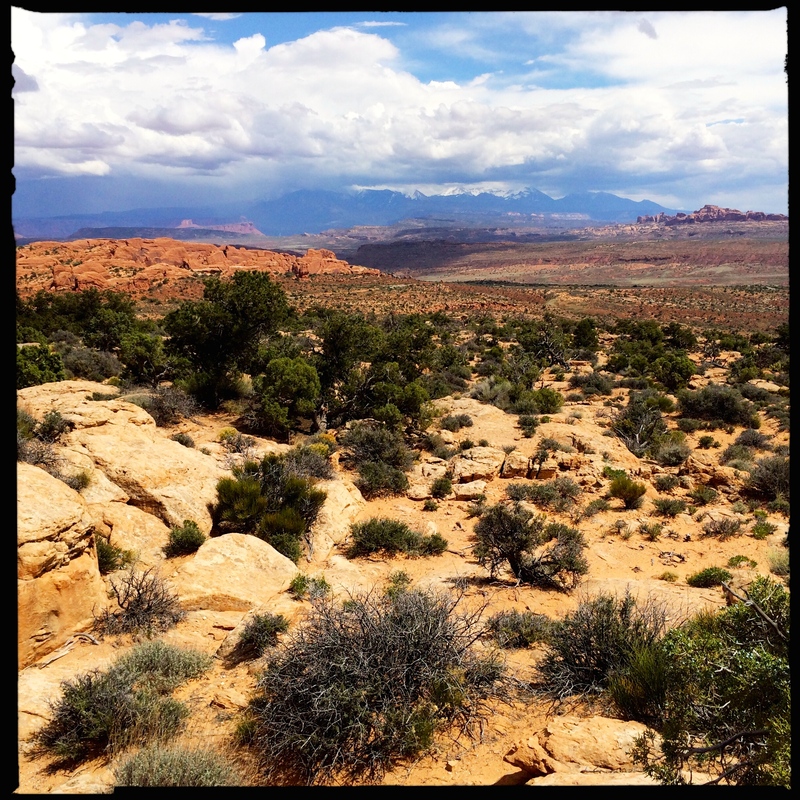 We ended up with two free spots before us and one behind, lots of space under the circumstances, and a view of the cliffs north of Moab, two shade trees, a fire circle, a picnic table. A fuse was blown in the camper. A minor wrench, I maintained my equilibrium. I walked back to the office for pliers, woefully absent from my toolbox. I felt so keenly for her. How could she know how completely her life had changed? I hope I helped her in that moment. Back at the campsite I told my friends the story. Something dreadful had indeed happened, just not to me and mine. The girls and dogs were safe and well, the cat was fine. I pulled the fuse and found it fried. In town we found a replacement, and then we drove up into Arches for the afternoon. Two of us had been there before and love it, for one of us it was a complete unknown. I couldn’t shake my sense of Katie’s loss and grief. She had been just minutes before a carefree girl happily doing her job on a beautiful day, and now her life was changed irrevocably. “I didn’t even know there was anything wrong,” she said, wiping her tears. So often we never do. I have a real issue with suicide. On the one hand, I get it, on the other I can find no excuse. I gave her something to do, finding the pliers, and that maybe helped to ground her. She was self-contained and stoic, and returned to work in the office. Touched by her grief, not my own, I struggled to come back to our day. As I drove, I had to breathe in that young woman’s suffering and breathe it out, let it go. I had done what I could for her. She needed to get home, be with friends and family. I breathed it in and breathed it out as we drove through the park. My friends’ enthusiasm for the scenery, the drive, the good time we were sharing, and the timeless spectacular landscape all drew me slowly back into our moment, so different now from hers. 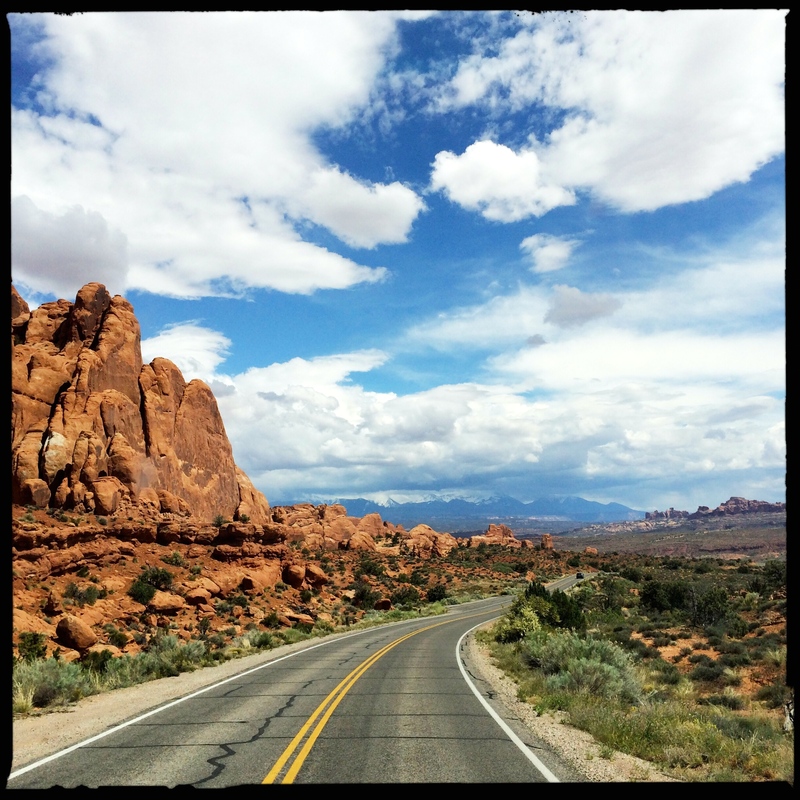 Driving through Arches National Park. Walking rains and shifting shadows added drama to the desert landscape, with the snowcapped LaSal mountains in the distance. That night at the picnic table our talk turned to some of the sadder stories in our own lives, suicides of friends and family, abusers we had known and loved and left. We all turned in early to our respective beds, to read and ponder. In the morning overcast and rainy, we drank coffee around the small table in the Mothership, three dogs curled around us and the cat below the bed. Our friend, now dearer, went on her way, and Deb and I packed up the Mothership and came home. It was another good day. Il pleure dans mon coeur, Comme il pleut sur la ville. I know of no one who doesn’t suffer. Sharing our sorrows we sow the seeds of love. Three tired dogs curled up on the Mothership bed in the rain. Thanks for sharing. Truly thanks for sharing your talents, your compassion, your time, your visit to the desert and your wonderful company. Loved spending the day driving through that spectacular country with you and Deb and the dogs and the invisible kitty. Love you Rita!